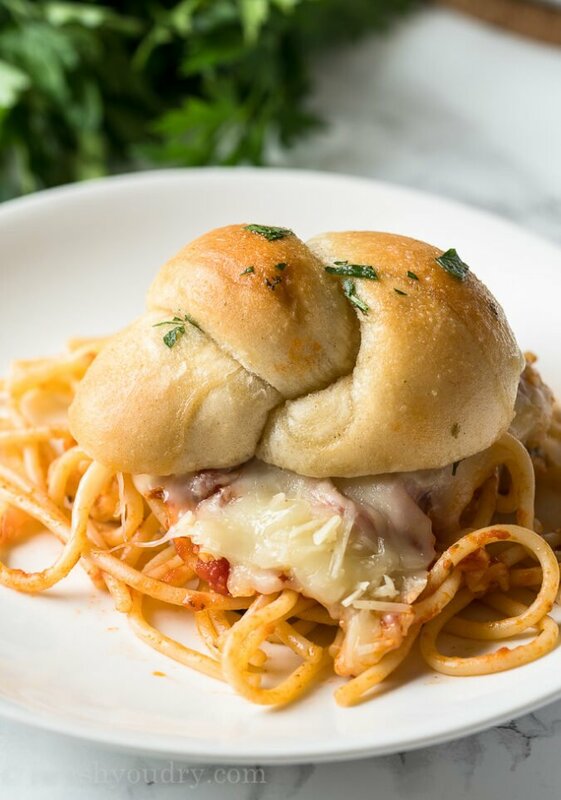 These Spaghetti Garlic Knot Sliders are everything you love about a classic Italian dinner, but in a fun handheld bundle! I’ve partnered with Walmart to bring you this fun and easy weeknight dinner combo that is sure to bring some smiles to the table. We’re big fans of Spaghetti night in our house. It’s one of the easiest meals to prep, that even my 13 year old daughter makes it for the family on occasion. 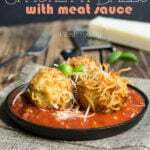 I’ve made fun variations like these Spaghetti Balls with Meat Sauce and this One Pot Spaghetti and Meatballs, but one thing never changes… we always serve spaghetti with a side of garlic bread or these Savory Garlic Knots from Walmart. So why not combine them? 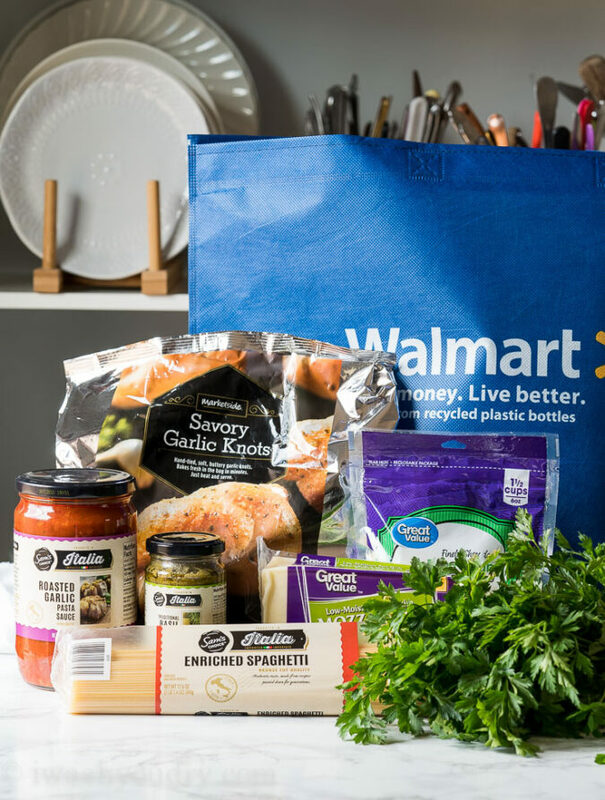 Have you spotted the Sam’s Choice Italia line of products at Walmart yet? The pasta is hand crafted in Italy and then directly imported into the US. It’s an authentic bronze cut pasta, which means the sauce will stick to the noodles better. 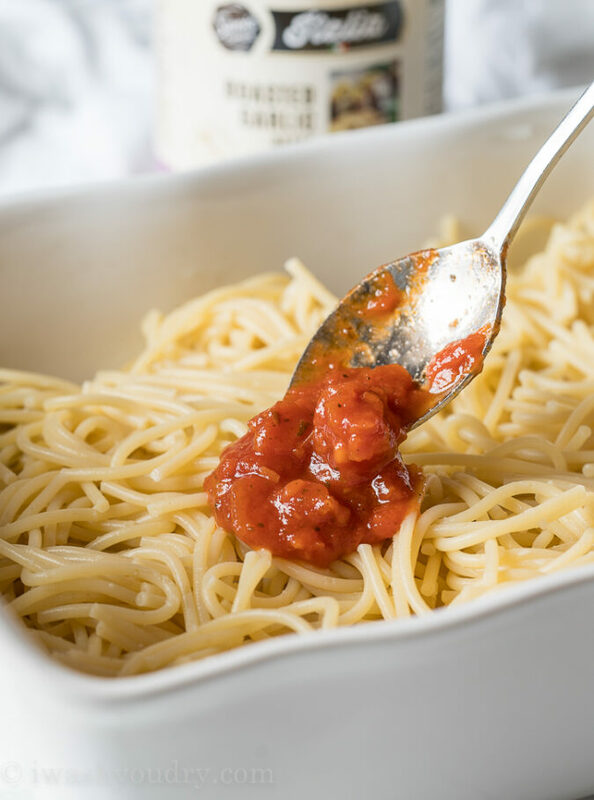 Speaking of their sauce… it’s all made with 100% Italian Olive Oil and the freshest Italian cherry tomatoes. The flavor is robust and delicious, but the best part is that all of these quality products are at a convenient and affordable price! Cut each knot in half and place the bottom half in a baking dish. Spread a little bit of basil pesto over the bottom half of each garlic knot. Break the pasta into thirds before boiling to make it easier for picking up the sliders later. Once the noodles are cooked you’ll drain and then spread over the garlic knots. 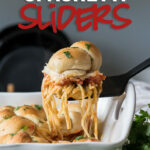 Try adding a few slices of pepperoni to each slider. Brown a 1/2 pound of Italian Sausage and sprinkle over the sliders. For crispier slider buns, prebake the garlic knots according to package instructions before slicing in half. One of my favorite things about this sauce is that it’s so thick and not at all watery! 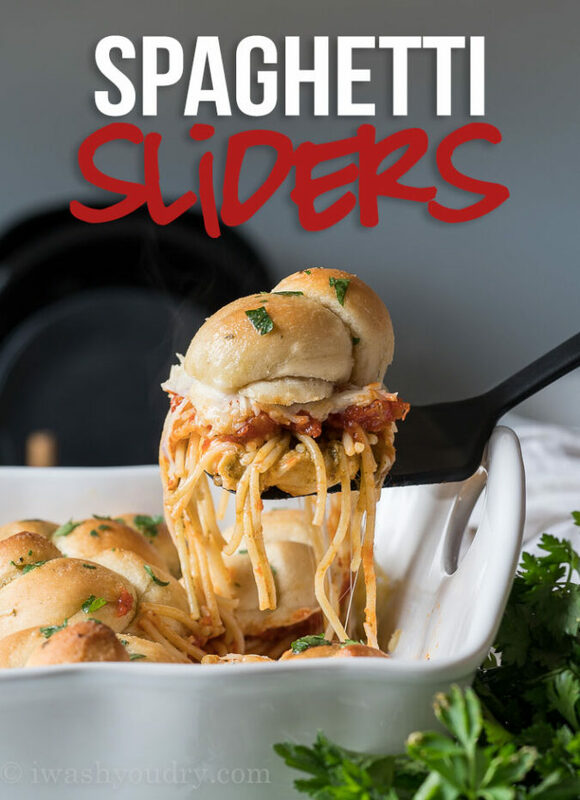 The sauce really sticks to the noodles which make these sliders easier to pick up and enjoy. Although I found myself still reaching for a fork, my kids went right in with both hands and LOVED it! The garlic knots come slathered in butter so when you place the top half back on the cheese covered spaghetti you can just pop them right into the oven to bake until golden brown. When they come out of the oven I brush the tops with a little more melted butter, garlic powder and freshly chopped parsley for the perfect finishing touches. These were a slam dunk at our house. The kids demolished them! 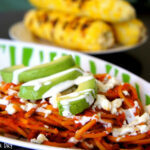 Give your spaghetti night a new twist with this fun and easy recipe! 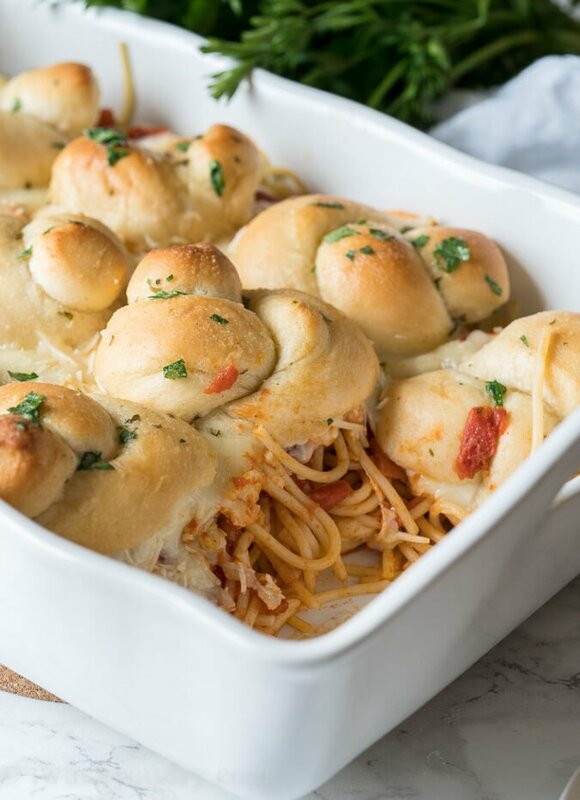 These super easy Spaghetti Garlic Knot Sliders only take a handful of ingredients to make and come together in no time! Preheat oven to 375 degrees F. Boil noodles according to package instructions, drain and set aside. Meanwhile cut each savory garlic knot in half like a sandwich and place the bottom half in a 9×13″ casserole dish (I used only 12 garlic knots and saved the rest for another day). 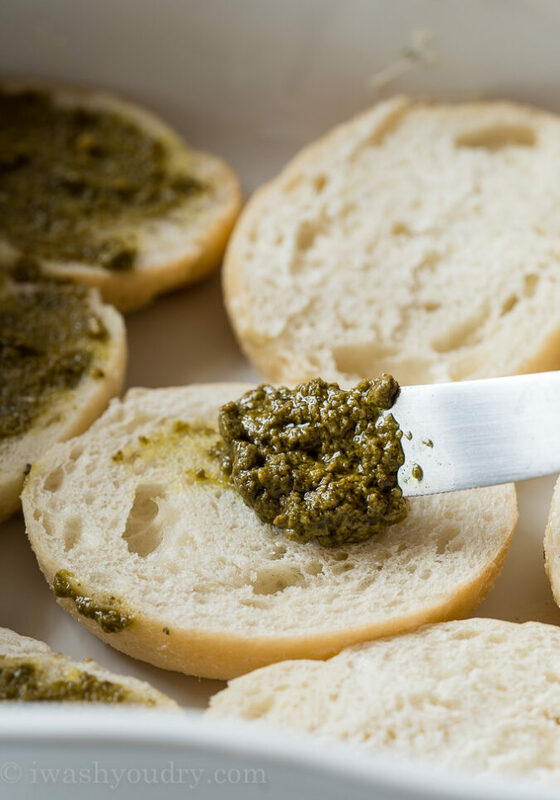 Spread the basil pesto on top of the bottom half of each garlic knot. Spread the cooked pasta over the garlic knots, followed by the pasta sauce, shredded mozzarella and parmesan cheese. 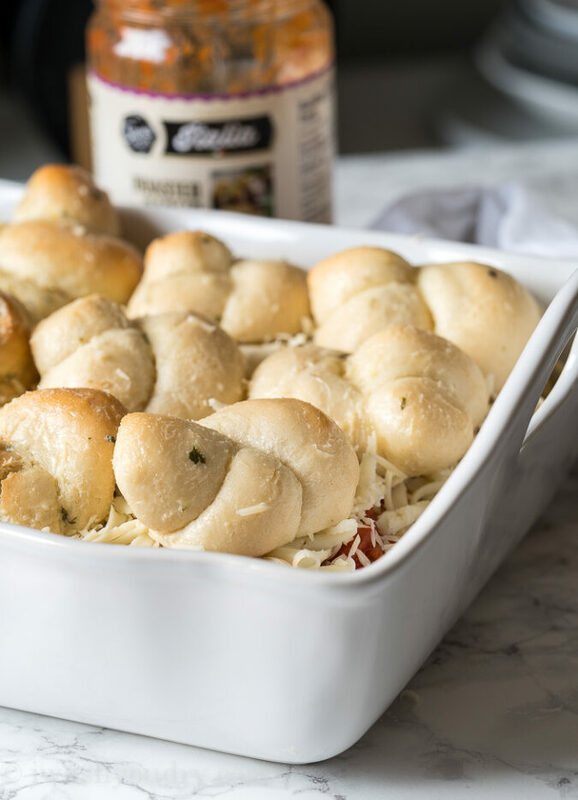 Place the top half of the garlic knots on top in an even layer and BAKE FOR 12 to 15 minutes, until garlic knots are browned and cheese is melted. Combine the melted butter, garlic powder and parsley in a small dish. Brush over the tops of the garlic knots when they come out of the oven. Serve hot and enjoy! Try adding 1/2 pound browned Italian Sausage to the sauce to bulk up this dish! Disclosure: This post is in partnership with Walmart. All thoughts and opinions are 100% my own. Thank you for supporting the brands that help make I Wash You Dry possible. This dish looks so great! Thank you for sharing the recipe! 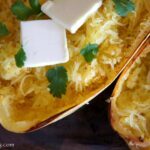 I like spaghetti and garlic bread so much, gotta try this recipe, when the food I like are combined.